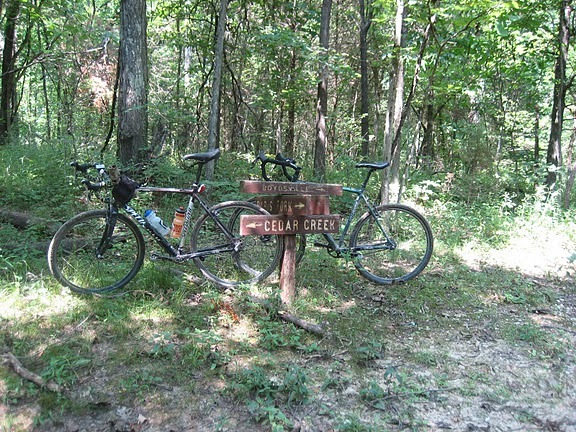 Thanks to a dying camera battery, Adam and I weren’t able to get a lot of photos from our Monstercross trip on the Cedar Creek Trail last friday. Even so, it was great training for upcoming adventure races, and a great way to add to our ever-growing collection of tick bites. If you want to follow our route, a copy of the Cedar Creek Trail map can be found here. We began our voyage at the Dry fork campground, proceeding North along a gravel road in 90+degree heat. The riding was difficult at first, but after a few minutes we were in the woods and somewhat shaded. For the first mile or so, the trail was in good shape with a few creek crossings. After that, it pretty much turned to crap. My only complaint with the Cedar Creek trail system is that horseback riding is allowed there. At the risk of sounding like a crybaby, those horses absolutely ruin a good trail. There are unavoidable patches of mud out there so deep your entire foot goes underwater. I’m not even going to elaborate on the gargantuan-sized piles of horseshit littering the trail. Eventually, the hike-a-biking got so frequent we decided to hide the bikes along the trail and set out for the rest of our journey on foot. It was easier to take in the scenery while on foot anyway. 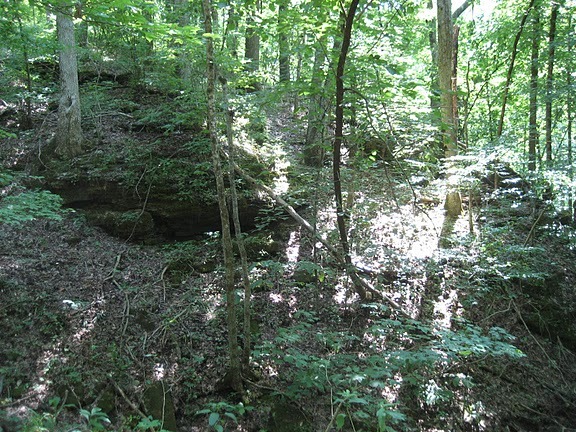 On this section, there is a steep cliff just to the right of the trail. Once the trail joins up with the Smith Creek section, there are some quad-busting climbs and very nice scenery. The rock outcroppings lining the trails are a sight to see, but of course you can’t tell by photos. It’s almost sickening when you compare photos to reality. 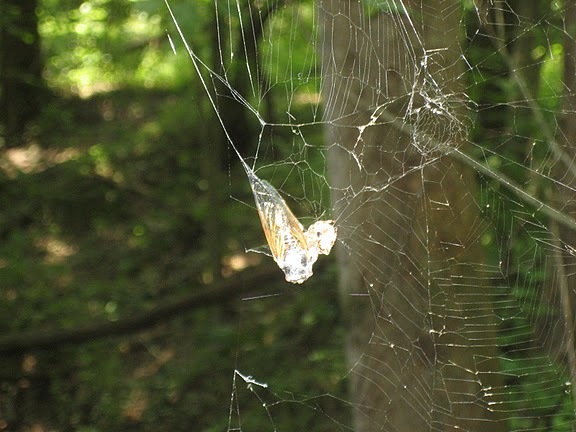 Along our descent into the creek, Adam noticed a very unfortunate cicada and a very fortunate spider. At the bottom of the descent, we found ourselves standing in Cedar Creek. We had expected the water to be cool and refreshing..we were wrong. It was warm and disenchantingly murky. 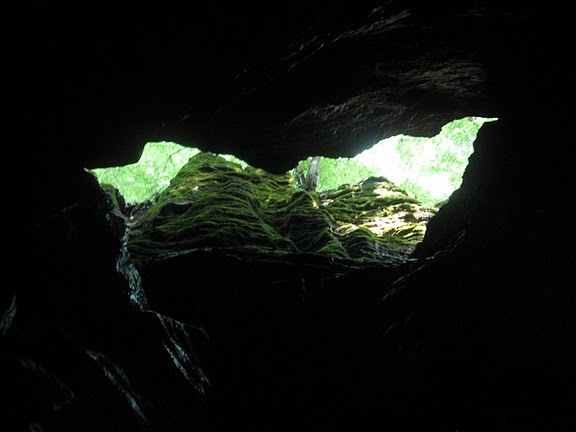 Our plan had been to hike North, (in the creek), until we found ourselves at Rutherford Cave. By my estimates we would only be hiking in the creek for 1/2 a mile. We would later learn that I haven’t learned much about navigation. The water ranged from ankle to chest deep, and we were fighting the current. Forward progress was slow and hard earned. Slugging along, we talked about how much harder this would be if we were 20+ hours into an adventure race. We also discussed the fact that we had left all of our food back at the bikes. Who could guess how many calories we were burning trying to walk in chest-deep water. Too bad Luke wasn’t with us, he would have never let that happen. I’d say we sloshed along for about an hour before I saw what could only be Smith Creek, and that meant I’d made a pretty serious navigational blunder. Thanks to my mistake, we’d been wading in the creek parallel to a dry trail about 50 yards off the bank. Passing Smith Creek also meant we were close to the cave, and the thought of being in a 60 degree environment was very motivating. 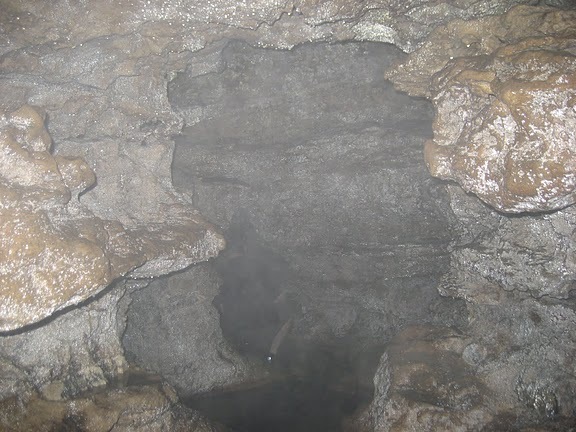 We hid our packs near the cave entrance and went in with helmets and headlamps. The cave was cold indeed, and the water running past our feet was absolutely frigid. About 30 yards into the cave there’s a place where you can go either left or right, but you eventually end up in the same spot. The only difference is that if you go left, you have to walk in ice-cold water up to your thighs. Needless to say, I watched Adam go left as I went right. It was very entertaining. 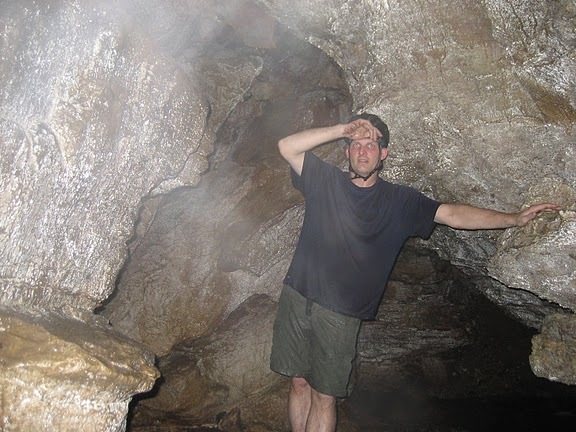 By now I was starting to bonk, so I had to take several breaks along our cave-tour. On one such pit-stop, I had the good fortune to spot a small cave-frog. Very interesting little guy, I can’t help but wonder what possible food source he had in there. Soon we could see a light ahead, and we knew our trip into the cave had come to an end. It would have been fun to climb completely out of the cave, but it looked pretty dangerous and we knew nobody had a clue where we were. Dying in a cave isn’t really something either of us wanted to do, so we turned around and headed back out. I think it’s worth mentioning that the above photo was taken in complete darkness. I guess this is one scenario where a camera captures better recorded detail than the human eye. After making our way out of the cave, we both started to really feel like crap. We could only surmise it was from all of the temperature changes we had experienced. Either way, we decided to float around in the creek to relax before we left. As luck would have it, we encountered a couple of guys toting a cooler full of ice-cold beer. Talk about a lifesaver, that was the best can of Stag I’ve ever had. It was also the FIRST can of Stag Adam had ever enjoyed. I guess dreams really can come true on these little adventures. It was a long hike back to the bikes, but we both got our second wind when the sun started to set. A large amount of horse destruction lead to and even larger amount of profanity, but we made good time. After one epic crash, and quite possibly the biggest bruise I’ve had in my adult life, we finally made it back to gravel roads and then to the Dry Fork Campground. We’ll be doing this trip again quite soon. In fact, I plan on doing something very similar to this on wednesday or thursday this week if anyone is interested. 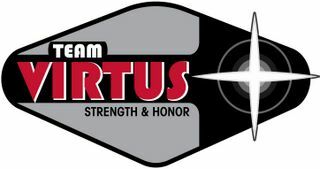 Posted on July 4, 2011, in Adam is re-hired to the team, Luke didn't get to go, Nonsense and Tomfoolery, Training and tagged Stag beer. Bookmark the permalink. 2 Comments. Shouldn’t Adam have remembered the spare batteries? Perhaps he should be fired for the lapse. Come to think of it, it’s probably his fault pictures don’t do a better job of capturing how big hills are and how cool rocks are. Looks like a cool trip. Well, other than the hunger part. But as hot as it was, your creek wade might have helped you out…plus making for a pretty funny story. I really hate that you guys always plan awesomeness when I’m not able to go. You’re both jerks, and I WILL be doing this trip the next time you guys decide to do it (assuming I’m not out of town again). How many miles did you end up biking and then hiking? How long were you guys out there? Did you camp? And finally… Why in the hell did you leave all of your food behind?!?! ?